One of the hottest stars in the galaxy has been discovered by astronomers. The dying star at the centre of the Bug Nebula is 35 times hotter than the sun with a surface temperature of 200,000 degrees. This is the first time the star has been pictured despite numerous attempts by stargazers across the world. Astronomers at The University of Manchester's Jodrell Bank Centre for Astrophysics were amazed to find they had captured the central star using the recently refurbished Hubble Space Telescope. 'This star was so hard to find because it is hidden behind a cloud of dust and ice in the middle of the nebula,' explained Professor Albert Zijlstra from The University of Manchester. 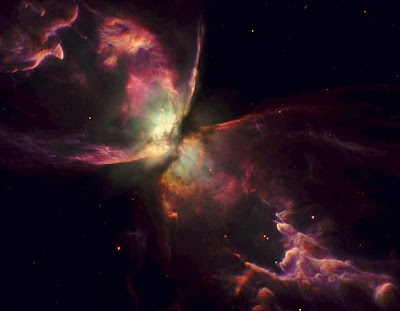 The Bug Nebula is about 3500 light years away in the constellation Scorpius. The images were taken to show off the new improved HST, which space shuttle astronomers installed with a new Wide Field Camera earlier this year. Our own sun is expected to cool, and die in the same way in about five billion years time. The images will be published in the Astrophysical Journal next week.